The London Underground is a public rapid transit system serving Greater London and some adjacent parts of the counties of Buckinghamshire, Essex and Hertfordshire in the United Kingdom. If you have ever visited London you will be familiar with the easily recognized Underground logo which marks all the tube stations. 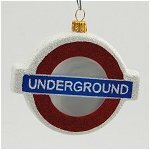 We have had a number of the better know stations made on an ornament with the station name on one side and the 'Underground' on the reverse. The London Underground is a public rapid transit system serving Greater London and some adjacent parts of the counties of Buckinghamshire, Essex and Hertfordshire in the United Kingdom. If you have ever visited London you will be familiar with the easily recognized Underground logo which marks all the tube stations. 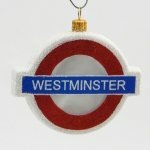 Our blown glass ornament is a single sided design that will remind you of a memorable city. Single sided design as shown. The London Underground is a public rapid transit system serving Greater London and some adjacent parts of the counties of Buckinghamshire, Essex and Hertfordshire in the United Kingdom. If you have ever visited London you will be familiar with the easily recognized Underground logo which marks all the tube stations. 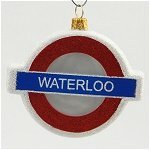 Our blown glass ornament is a double sided design that will remind you of a memorable city with Waterloo on one side and Underground on the other as pictured. If you have taken the train from Heathrow airport into London you will be familiar with this station sign. You and a staggering 35 million other passengers have passed in and out of Paddington. Paddington, also known as London Paddington, is a central London railway terminus and London Underground station complex, located on Praed Street in the Paddington area. The site has been the London terminus of the Great Western Railway and its successors since 1838. Much of the main-line station dates from 1854 and was designed by Isambard Kingdom Brunel. 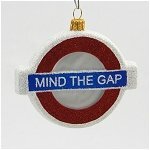 It was first served by London Underground trains in 1863, as the original western terminus of the Metropolitan Railway, the world's first underground railway. 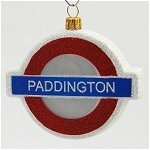 Today, Paddington tube station is served by the Bakerloo, Circle, District, and Hammersmith & City lines. Hang a memory on your tree this year with this beautiful blown glass ornament. If you have ever visited Big Ben or Westminster abbey you have probably been one of the millions of passengers using the Westminster station. The station is located at the corner of Bridge Street and Victoria Embankment and is close to the Houses of Parliament, Westminster Abbey, Parliament Square, Whitehall, Westminster Bridge and the London Eye. Hang a fond memory this year on your tree and recall your trip with this hand blown glass ornament from Poland.